Nominations remain open through May 3, 2019. PNCWA is represented well this year in Washington D.C. for the annual fly-in. Through a mix of funding, including PNCWA funding, eleven members are attending. This is by far our biggest year and we’d love to see an even bigger contingent next year. The group will be presenting the PNCWA positions on TSCA/PCBs, Integrated Planning, and Climate Change Resiliency located here. Additionally, they will be delivering a joint message from WEF, NACWA, AWWA, APWA, and other entities. They will hear from administrators from the EPA Office of Water on a variety of topics, including their intended focus areas for the upcoming year. 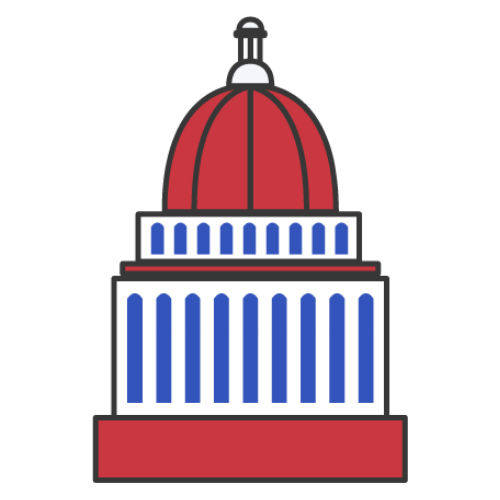 Check out the PNCWA public LinkedIn page this week for any updates from our fly-in team. The members attending this year are listed below. Stay tuned for a recap in May! At PNCWA, our mission supports the professional development of our members. The AWWA/WEF joint YP Summit provides the young professionals in our organization the opportunity to join other YPs from across the country to learn, grow, and build community. Each year the Student and Young Professional committee sponsor two member YPs to attend the YP Summit. Due to an increase in interest this year, the S&YP committee made a call for applications. 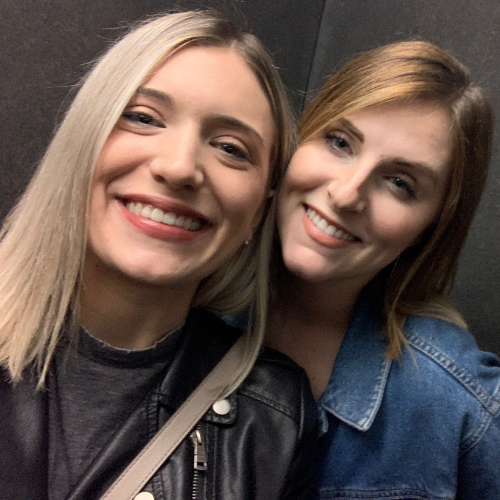 Erica Haide, a marketing professional from Brown and Caldwell, and Brittany Sorenson, an engineer with BergerABAM, were selected through the application process. Erica has been involved in the Pacific Northwest water industry since 2015. She applied to attend the YP summit because she knew it would only further her passion for the industry. “I would love to continue my leadership within the industry,” Haide explained. “The more exposure I can get with like-minded people will help me further those goals and turn them into reality.” Brittany was equally passionate but approached applying for a slightly different reason. “I got my PE a year ago and signed up as a WEF member but six months later felt like I hadn’t been a good member or taken advantage of member benefits like I had hoped,” Sorenson said. Come join our Pacific Northwest Clean Water Association (PNCWA) Students & Young Professionals Committee (SYPC) for a Resume Building Workshop on Monday, February 11 at Hot Lips Pizza-PSU! We will provide an introduction to PNCWA, followed by a Resume-Building 101 presentation, and we will finish with time for students to work with water industry professionals on their individual resumes. With the PSU Career Fair coming up on February 13, this is your chance to network with professionals in the water industry and get some last-minute help with your resume. Oh, and there will also be pizza! The PNCWA Annual Member Survey has been designed to provide feedback to the Board of Directors and Committees on how effective our organization has been at meeting the professional needs of our membership. The information contained in the surveys submitted will be used to determine PNCWA success in meeting it's strategic plan goals, adjust the plan if necessary, and provide feedback to the board and committee chairs to help identify what the organization is doing well as well as proactive suggestions for areas that may need a little more attention or improvement. It only take a few minutes: https://www.surveymonkey.com/r/PNCWAmemberSurvey2018. Flooding, hurricanes, earthquakes and scores of other hazards can wreak system-wide and regional havoc on lifeline utilities that serve critical health, safety, and environmental roles in our everyday life. Recognizing the role that functioning infrastructure plays in the near- and long-term recovery of communities following a devastating event, utilities across the country are taking a serious look at their resiliency. This webinar delves into the efforts many utilities are making to understand their risks by identifying vulnerabilities, modeling natural hazard scenarios, and defining the critical elements of their systems. The presentations will include project examples from the Pacific Northwest, with insights on building organizational awareness about the need for resiliency in the face of ever increasing demands on limited funds, getting efforts off the ground, and how mitigation recommendations are being implemented. 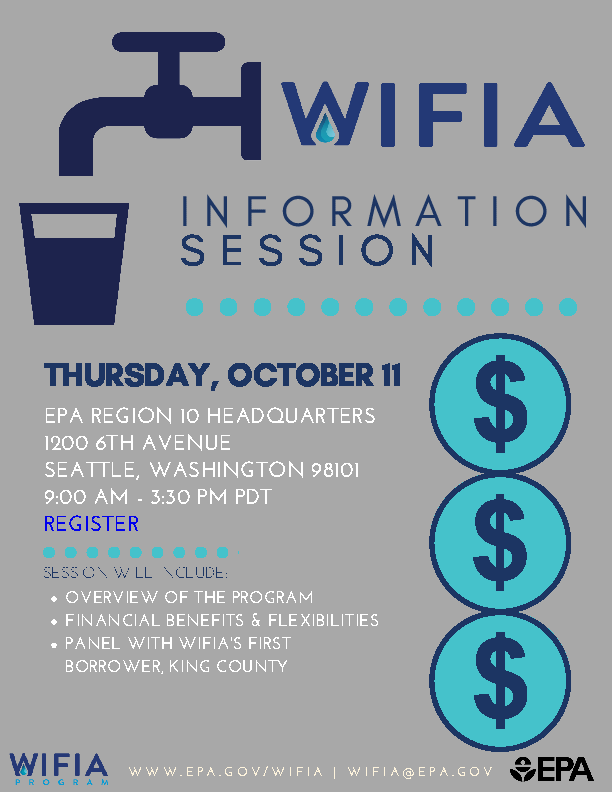 EPA’s WIFIA program invites you to join them in Seattle, Washington to learn more our low-cost, long-term loans for water infrastructure projects. The information session will provide prospective borrowers with a greater understanding of the WIFIA program requirements and pave the way for successful applications to the program. From WEF: (Alexandria, VA) - Scholarships are available for utility personnel to visit other utilities with innovations of interest. The exchange, supported by WRF, WEF, and NACWA, provides an effective way for utilities to learn about, gain confidence in, and adopt new technologies and approaches more quickly. As water resource recovery facilities (WRRFs) are transforming themselves into utilities of the future and becoming drivers of resource recovery, economic growth, and improved environmental performance, the implementation of innovative technologies, processes, and approaches is essential. These scholarships enable staff to visit and see innovations in action at peer facilities. The Member Association (MA) Awards were established to recognize outstanding Member Associations and MAs that excel in areas of membership retention, financial strength, new memberships, scholarship programs, student achievement and support, technology transfers, and/or award programs. The Pacific Northwest Clean Water Association (PNCWA) has shown outstanding growth in conference attendance and membership and is a creative, forward-looking WEF Member Association. Their onboarding programs to drive new membership and new member involvement have resulted in steady increases in both membership and annual conference attendance. This MA has developed several new programs for students and young professionals in recent years, including a popular summit, an adopt-a-school program to support water science education, and a strong and growing scholarship fund. PNCWA is actively working to increase the diversity of its membership and leadership, and has also developed a strong financial position. WEF is honored to recognize the PNCWA Member Association for its achievements in developing a growing, energized and diverse membership of clean water professionals in Washington, Oregon and Idaho. PNCWA has grown over the past several years to a position of financial strength (23% increase in end of year balance since 2008). Total assets at the beginning of 2018 are over $250,000. The association budgets an increase in reserve (5% increase per year) which has allowed for increased growth in the reserves to $134,010. In 2013, PNCWA initiated the purchase of event insurance for its annual conference ensuring protection of the main revenue source for the association. At the same time, a site selection committee began to secure future conference locations. The Site Selection Committee completed a thorough investigation of conference venues in the Northwest, especially focusing on exhibitor space. New contracts for venues allow for adequate growth, protecting the future financial success of the annual conference. And in 2016, PNCWA developed a financial modelling tool to assist with budgeting and rate setting, allowing for thoughtful rate setting discussions. PNW YP Summit Speakers Announced! Register now for the 2018 Pacific Northwest Student and Young Professionals Summit. We are excited to announce a phenomenal line-up of speakers covering topics on technical material and professional development as it relates to this year’s theme: Innovation. Want to see your water quality news shared on the PNCWA Newsfeed? 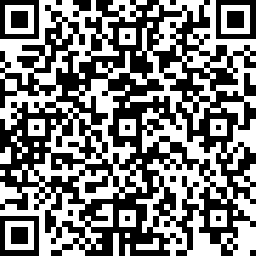 We'd love to hear from you—share your PNCWA updates, news, and content at http://bit.ly/submit-news-pncwa or by by clicking here.